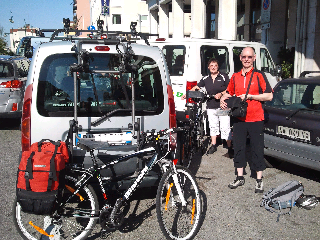 Veloce ® cycling and bike rental company : Our German customers from Venice to Slovenia by bike. Our German customers from Venice to Slovenia by bike. This morning, Sunday, we have delivered 2 Bianchi high quality hybrid bikes at Venice Mestre railway station. Our German customers will ride by bicycle to Trieste and Slovenia along routes suggested by Lonely Planet cycling guide.